Today was a tough day for good deeds. There’s a Salvation Army bell ringer on my street. I can hear her from the roof deck, when I open my door. Brrrring, ring, ring. All day. When I told my 2-and-a-half-year-old why she was there he decided he wanted to take some money out if his money box and put it in her bucket. So we put a few quarters in his coat pocket. (He doesn’t understand the paper money thing yet, so they had to be coins). Thing is, every time we go down to donate them, she’s not there. I feel like she’s avoiding us. Today it’s cold in New York. It’s also #GivingTuesday, so there are plenty of options for my one good thing. From Reading Empowers to NYRR Youth Programmes. I’ve had suggestions from friends (thanks to the lovely Dallas from Skilled With Kids) and emails and facebook alerts from all sorts of charities and organizations needing help. They are all worthy causes, and I will be giving to a couple of charities close to my heart this evening. But I would have done that anyway, so I wanted to get something for the elusive Salvation Army woman too. When I spotted her outside Wholefoods this lunchtime I ran in and grabbed her a coffee (to warm her up) and a muffin (just because). I was already feeling good just carrying them through the store. But when I got outside she had gone. Again. So today’s deed hasn’t been so easy. I even tried to give the coffee and muffin to the doorman on my way into the building but he declined too. So did the maintenance guy. We ventured down to Macy’s to see Santa this afternoon – another disaster. My little boy wouldn’t go near him, let alone sit for a picture. It then took us fifteen minutes to persuade him to put on his coat back on and get outside. Feeling utterly deflated we trudged back to the subway in the rain. And then we (heard then) saw these guys doing a brass band version of the Eye of the Tiger. With choreography. Brilliant. Take a look at the video here. Lesson of the day. A chance to do something good always presents itself. We had a chat with the guys, complemented them on the music, bought a ten-dollar CD and gave them the change out of a twenty. They loved it. Just shows, it’s the little things that make our day. My little one has watched the video at least twenty times, which has definitely been the best part of his day. Oh and my husband got to eat the Wholefoods muffin, so everyone’s happy. 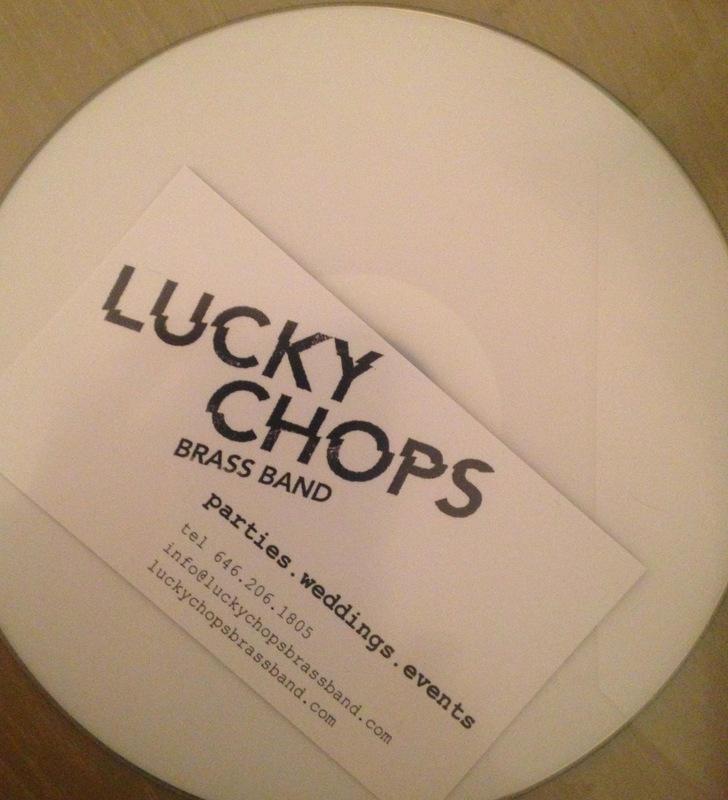 Oh, and if you’re around Lucky Chops are playing at Grand Central 12-3pm on Thursday. Don’t miss them.